The week started at SPX 2850. After a higher open on Monday the market rallied to match its all-time high on Tuesday at SPX 2873. After that the market started to pullback. By Thursday the market had pulled back to SPX 2854. Then it rallied on Friday to set a new all-time high at SPX 2876, before ending the week at 2875. For the week the SPX/DOW gained 0.7%, and the NDX/NAZ gained 1.2%. Economic reports for the week were mixed. On the downtick: existing/new homes sales and durable goods. On the uptick: weekly jobless claims improved. Next week’s reports will be highlighted by Q2 GDP and Case-Shiller. For over two years now we have had a target of SPX 3000+ by 2018+. This year we expanded the definition of that target by including three other stock market indices: the DOW, NYSE and the DJW index. We not only expected the SPX to make new highs this year. Which it did this week. We are also expecting the other three indices to make all-time new highs before the bull market ends. and the DJW is 5.4%. The 2+ year Major wave 1 bull market continues to unfold. Intermediate waves i and ii completed in the spring of 2016, and Intermediate waves iii and iv completed in the spring of 2018. Intermediate wave v, to complete Major wave 1, has been underway since early April and has already reached a marginal new all-time high. The minimum price for the wave pattern has been achieved. The Intermediate wave v uptrend from early April continues to unfold. We have been labeling the five waves up to SPX 2791 in mid-June as Minor wave 1. The pullback to SPX 2692 in late-June as Minor wave 2. And the recent rally, from that low, as part of Minor wave 3. From the late-June SPX 2692 low we had five small waves up to SPX 2863 by early-August: 2743-2699-2848-2796-2863. This can be considered Minute wave i of Minor 3. The decline that followed to SPX 2802 could be Minute ii. And Minute iii of Minor 3 is underway now. From that SPX 2802 low the market has rallied straight up in one wave to SPX 2876 by early this week. As noted above the current rally from SPX 2802 made an all-time high this week at SPX 2876. We have noted it was a straight up rally. There have been three small reversals along the way that could have created seven small waves: 2819-2806-2850-2834-2873-2854-2876. If this is correct then a larger pullback could occur when it completes nine waves. 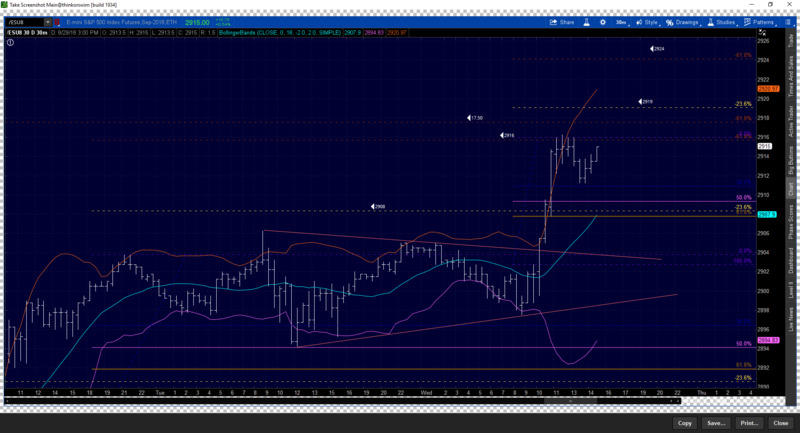 Support for that pullback would probably be in the OEW 2835 pivot range. After that the rally should resume. Short term support is at the 2858 and 2835 pivots, with resistance at the 2884 and 2929 pivots. Short term momentum ended the week overbought. Best to your trading! The Asian markets were mostly higher and gained 1.2% for the week. The European markets were mostly higher as well and gained 0.6%. The DJW index gained 1.2% and the NYSE gained 0.7%. Bonds continue to uptrend and gained 0.2%. Crude looks to be uptrending again and gained 5.4%. Gold may also be in an uptrend again and gained 2.5%. The USD looks to be starting a downtrend and lost 1.0%. Tuesday: Case-Shiller and consumer confidence. Wednesday: Q2 GDP (+4.1%) and pending home sales. Thursday: jobless claims and personal income/spending. Friday: Chicago PMI and consumer sentiment. Looking to be back in cash by EOD. Always appreciate the charts Phil. Thanks. Schiz…please don’t lose any sleep over this. That level is nothing more than a larger 61.8% target. Some of these algorithms are programmed to take profit at this level, as it is rarely exceeded on the first attempt. Higher probability is that there will be a pullback to a 50% long up. Phil’s chart…. one of his anhor set ups from a previous set up. Don’t have my trading computers on….Just the way Phil does his charting. BTW, with some programs, when you draw the set up with both the high and low anchors, the profit target of that move, as well as the 23.6%, 61.%, -23,6% and -61.8% of that move are automatically labeled.